Randy Weston is a giant of jazz, and not just because he stands 6'8" and has hands the size of hams. Nearly 82 years old, he still has a lot to say when he walks onstage and folds his frame onto a comparatively teensy piano bench. Weston begins the final set of his two-night stay at the Dakota with a Monk mélange; the frame is “Well You Needn’t” but we hear bits of “Bemsha Swing” and “Misterioso.” It starts as solo piano, then Blake and Clarke join in. Blake’s style of playing the bass is unique and unforgettable. He sits behind his instrument and draws it toward him. He presses the strings on the fingerboard with his left hand, as is customary, but his right hand is anything goes: strumming, slapping, and yanking the strings, sometimes rapping on the body, often while Blake hums the melody of the tune he’s playing. It’s an amazing style and sound, fascinating to watch and exciting to hear. Meanwhile, Clarke gives Monk a distinctly African sound on his conga array. We’re off and running. Up next, “Blue Moses” is a Weston original, a bow to the Ganawa people of Morocco, with whom Weston lived and worked for many years. On some recordings, this song is titled “Ganawa (Blue Moses).” The big, dense chords he plays are reminiscent of McCoy Tyner. 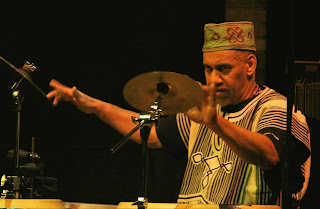 During his energetic solo, Clarke nearly loses a conga. “High Fly,” another Weston original, is the tune you first hear when you visit Weston’s excellent Web site. It’s loose, languid, and gently swinging. 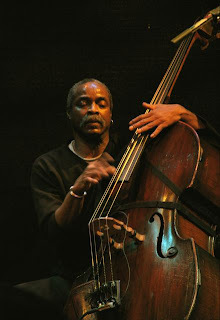 Weston has recorded it twice, most recently a just-over-two-minutes version on his latest CD, Zep Tepi (2006). Why so short there? Left longer, as in live performance, it becomes meditative and mantra-like. “Love, the Mystery Of” was composed by Ghanaian percussionist Koffi Ghanaba, one of the first to bring the African drum to the United States. It’s a showcase for Clarke’s talents as well. Throughout, this has been a true trio event, not a star turn for Weston. In retrospect, I think we heard more from Blake and Clarke than from Weston himself, who often sat back on the bench, without comping, smiling while they soloed. The Dakota audience is rapt and respectful throughout the performance, which ends with “Love, the Mystery Of” and no encore. Weston wishes us all “Peace and love and more music” and exits the stage. It’s enough. To repeat, Weston’s Web site is excellent and worth a visit. 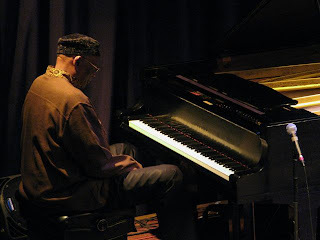 Photos, top to bottom: Randy Weston, Alex Blake, Neil Clarke. Blake and Clarke photos by John Whiting. View Don Berryman's video of "Blue Moses." Good news: Some YouTube videos, including this one, have recently been converted to high-definition. Great show. There is a nice video too.